I’ve developed a bit of an obsession over the past few months with a pretty lowbrow treat: Munchies Cheese Fix Snack Mix. I think it’s absolutely the best one on the planet, beating out anything Chex or Cheez-It or Annie’s or Utz can whip up. Why? Because it’s the SuperFriends of snacks. 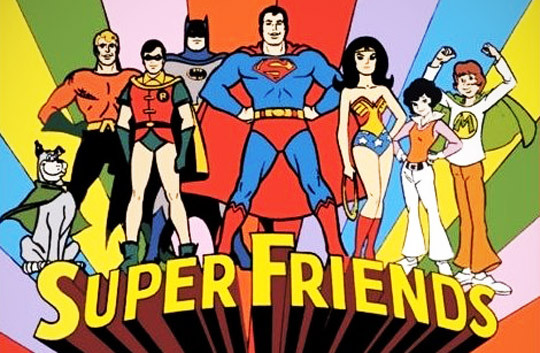 Why do I say Superfriends? Well, just like Superman, Batman, Wonder Woman and that fish guy, you have a combination of things that are powerfully good alone and even better when mixed together. First up are Nacho Cheese Doritos, the gold standard of processed snack foods. That’s the Superman of the bunch. Then there’s Crunchy Cheetos, science’s attempt to imbue an ordinary food product with superhuman capabilities. That’d be Batman, with all of his high-tech gadgets (I guess you could also consider the puffy kind to be Robin, the far less capable and almost unnecessary sidekick). The Sun Chips are like Wonder Woman, something thrown in for the girls and the Rold Gold Pretzels are like Aquaman, an indispensable if unremarkable member of the team. Somebody’s got to be able to call in the whales! Add them all up and you have an irresistible force, at least where I’m concerned. I’ll admit it – I’m addicted to this stuff. So much so that it’s what I had for dinner last night along with a few Dale’s Pale Ales. The flavors, the textures, the crunching – it’s all perfect. To that I’d say, “umm…well… you have me there…but just taste ’em – irresistible!” Love doesn’t lie! So there it is, my latest obsession – a bad snack food. This stuff scratches an itch that no Chex Mix or Cheez-It or any other regional snack mix can come close to scratching. Hell, I don’t even LIKE snack mixes and I can’t stop eating this stuff. If I don’t stop soon, I’ll need to start wearing sweat pants to work to accommodate my growing gut. Uh oh. I just realized – maybe this stuff isn’t the Super Friends at all – maybe it’s actually my kryptonite! ← I Turned the Slideshow Thingy Off on the Home Page. Whaddya Think? Ugh, you and my husband both. He goes in jags where he’ll eat 4-5 bags of this in a week. Gross. Besides, Munchies don’t hold a candle to Flavor-Blasted Goldfish… I swear those things are coated in a cheese-salt-heroin combination. I think your husband has it right – there is no defense for something this awesome and once you get rolling on a jag, it’s hard to get the air out of the tires. I didn’t even need to see what you were writing about. I saw the headline and knew right away that you were talking about Munchies. Once every few weeks, I’ll snag a 70 cent bag of that stuff out of the vending machine at work. I believe that the cheese-flavored dust that they sprinkle all over those items should have a food group of its own. I’ll admit to eating some of these snacks on occasion every now and then… though I prefer Chips and Salsa! Chips and salsa are good, but these are like some weird chemical dependency I’m developing! I have the same problem with the Gardetto’s snack mix. I just can’t resist how those mini rye chips interact with all of the other ingredients. I like how the Superfriends have their own spotlight on the bag, but Utz Pub Mix is the Grail. No substitutions. I mean c’mon–Worcestershire Rye Chips? Honey Roasted Sesame Stix? Nacho Bagel Chips? Exotic and pedestrian at the same time. And an empty tube makes a fine planter. Just sayin’.